In terms of cinematic debuts, I cannot think of many that equal Sergei Eisenstein's Strike. There's Orson Welles' Citizen Kane, but other than that I cannot think of a debut film that is a brilliant work of cinema. I'm not comparing Strike with Welles' first film, but Welles had more advantages than Eisenstein. Strike is a work of propaganda, and there is a touch of clunkiness to it. However, we can see how Eisenstein went from this to his series of epic Soviet films and became one of the leading lights of cinema. Divided into six 'chapters', Strike is the story of overworked factory workers at the mercy of fat tycoons and their network of spies to keep them in check. One day, Yakov Strongin, humble worker, is accused of having stolen a micrometer worth 25 rubles, or three weeks' salary. Having no recourse: either leaving in shame and branded a thief or having to sacrifice nearly a month's work, he hangs himself in the factory. This is the impetus for the strike, as the workers, horrified and angered by this, decide to take matters into their own hands. They demand such things as an eight-hour workday, civil treatment by management, and a 30% pay raise. They also ask for a six-hour workday for minors, but let's not quibble on small details. As the factory grows silent, the management takes no interest in settling things. Instead, they get their agents to stir up trouble, culminating with bringing a crackdown under false pretenses. As the strikers grow more restless and agitated, things come to a shocking conclusion when the military comes in and slaughters the strikers. The finale has one worker calling out, "REMEMBER!" "PROLETARIAN!" Make no mistake: Strike is Communist propaganda through and through. The film begins with a quotation from Lenin himself, as well as an endorsement from the Soviet newspaper Pravda, which called it 'the first revolutionary work of our screen. As a side note, it should be noted that Pravda means 'Truth' in Russian, ironic now given that 'Pravda' is shorthand for any time 'news' organizations pump out propaganda or straight-up lies to their audiences. Regardless of how one sees the politics of Strike, the film itself is an astonishing work. 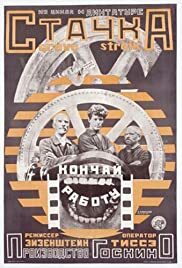 Eisenstein uses montage and symbolism brilliantly, and in terms of cinema Strike has more than earned its place in cinema history as an important work. This is because Eisenstein knew how important the visual was to tell its story, and some of the visuals are downright astonishing especially given the time and limited technology. For example, there is a shot of four photographs of the factory spies, which then come brilliantly to life in a seamless transition that leaves one astonished. There is also astounding editing when we see the 'blind' man looking at us and showing his disability was fake. Perhaps the most legendary use of imagery is near the end, as we see a cow slaughtered and cross-cut that with the slaughter of the masses as the troops march over the dead. It creates the emotional impact of the horror of the mass killing and links it emotionally with that of the cow being sliced open, its blood flowing out. As a side note, I cannot help but think that Strike, or at least Eisenstein, influenced directors like Lewis Milestone, for the ending of All Quiet on the Western Front draws inspiration from the Eisenstein method. Just as Eisenstein used the slaughtered cow to symbolize the slaughtered people, Milestone had the young men marching to their graves, a sea of crosses as they go towards their own unnecessary deaths. You can also see how the killing of the workers and their families would later be used and better-filmed in Eisenstein's follow-up to strike, Battleship Potemkin and the famous Odessa Steps sequence. The technical achievement of Strike leaves one almost overwhelmed and overpowered. The final moments of the 'scream' of 'REMEMBER!" and "PROLETARIAN!" make clear that Strike is a call to arms. The film ends abruptly here, almost shocking the viewer into action. Still, as astonishing as Strike is visually, leaving one almost breathless in its fire and fury, it is still a product of its time when it comes to the acting. To call it vigorous would be an understatement. Sometimes you wonder how even the collective called the Proletcult Theater thought they weren't over-the-top. Guess when you are overthrowing a dictatorship to impose another one, you don't have time to study Method acting. Strike shows its age in more ways than one, but in terms of visuals and the emotional push the film has, it still is a landmark achievement.